A specialist team is being drafted in to come up with a solution to make a village hit by a landslip fully accessible again. New figures have revealed the number of people dying as a result of road crashes in the North-east has decreased. A newly-opened section of North-east road will allow road users to bypass a bottleneck junction. A North-east road will be closed for five days to allow for essential sewer works to take place. Bus routes in an Aberdeen community will be hit by a road closure for around a month. More than a dozen people have been charged following a police crackdown on road safety and vehicle offences. More than one in 10 drivers in Aberdeen have said experiencing someone else' road rage has left them scared to drive, a study has revealed. 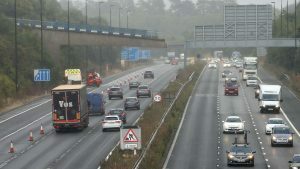 North-east residents have grilled AWPR managers over "nightmare" traffic, slow road repairs and crash fears, in advance of the closure of a major road for 14 weeks. A roundabout on a busy Aberdeen road could be replaced with traffic lights if a local authority's plans go ahead. Two men are being treated after a blaze at an Aberdeen flat. A popular commuter route in the North-east is set to reopen tomorrow. Drivers experienced delays on a busy Aberdeen road due to gas and sewer installation works.